April 23rd marks St George's day in the UK, St George being the patron saint of England. Not marked or celebrated as much as the Irish St Patrick's or the Welsh's St David's day but a national day all the same. Fear not this dish does not contain any toads! Or holes for that matter . . . so where or how the dish got its name I do not know and have never been able to find out. So if anyone out there does know I would love to hear from you? I agonised over what recipe to include this week for this occasion and I could have gone for something fancy but finally decided on this very traditional dish. Served traditionally and plainly with no fancy professional chef tricks. Why? Well those of you outside of the UK will have no doubt never heard of it and the name would be quite a novelty. While the English and ex-pats out there will hopefully appreciate a recipe for a nice Yorkshire pudding mix and maybe a trip down memory lane? Whilst Toad in the Hole is a British dish the origins of the name Toad in the Hole are lost in the mists of time. 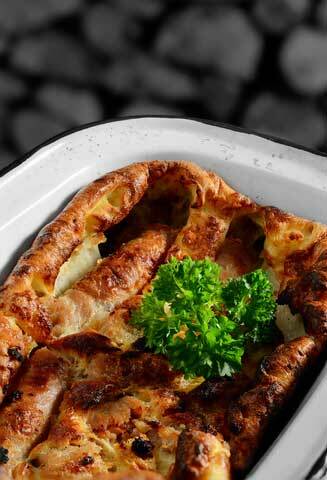 The dish Toad in the Hole was first recorded in print in 1787. Nowadays the 'toad' is invariably sausages although you can find it made with lamb chops. The filling was not always made with sausages or lamb chops. Leftover meat, including chopped beef, lamb and kidneys, would often be used as an alternative. The batter used to make Toad in the Hole is the same as a Yorkshire Pudding batter. Serving batter with food in this manner was intended to make the available meat go further. When times were much harder and meat was a rarity, Yorkshire Puddings were served before the actual roast with rich gravy. The texture was intended to duplicate the meat and the gravy to give the flavour of beef. This would reduce the appetite of the person so that less would be required when the roast meal would be served after the Yorkshire Pudding . . . with no need for large portions of expensive meat. In the same way Toad in the Hole is intended as a way of making a meat dish go further. It would very much have been a dish of working families during the Industrial Revolution and during times of hardship when meat was scarce or expensive. This dish is similar, in that sausages are used as a cheap meat alternative, bulked by the Yorkshire pudding and enhanced by a rich meat gravy. I have used the exquisite English Cumberland sausages but any sausage that is your favourite can be used, obviously the better quality sausage the better the dish. Other meats may also be cooked and served this way To this traditional dish may be added many other ingredients for interesting variations: chopped parsley or coriander to the batter, garlic to the gravy. Enjoy your Toad in the Hole and bon appetit . . . . .